At the start of October we wrote our first #TeamTomatoJos Founders Update, and this blog post ended up being extremely popular with our readers. Now, as we enter 2015, we are excited to share our reflection of the highs and lows of the last quarter, as well as our plans for the coming months. At the start of the quarter, we were a team of two. But we finished 2014 with an operational team of 5, not including security and our driver. We hired our farm manager Bala Dabang in November, and he has taken over full management responsibilities of the farm attendants whom we hired in October. We also hired a consultant agronomist, Al Williams, who travelled all the way from California to join the team for a few weeks in December. Al has over 40 years of international experience in vegetable production, and he provided crucial support in the weeks leading up to transplanting. His support will be ever more important as we harvest. Our team is truly our most important asset. The long-term success of Tomato Jos depends not only on our own drive, but also on our ability to inspire the same level of determination and dedication in our staff. Unfortunately, a few of our early hires weren’t the right fit for our organization, so we had to go through the difficult process of letting some of our staff go in December. Going forward, we have implemented a system to bring employees onto the team first for a 1-month probation period before hiring them full-time. Next quarter, we will add processing staff to our team with an immediate focus on finding a factory manager and quality control expert. We also plan to bring Al back to the farm to support our harvesting activities, as well as another agronomist from California with expertise in tomato farming. We spent a considerable amount of time identifying two farmers with whom we will work in this first pilot year – together with our landlord, we found land for them on a plot near the river, so they will have access to water resources when they farm. Each farmer has 1 acre of land, and about .5 acres have been transplanted so far. In this first season, we decided to work with farmers who could serve as “lead farmers” and be role models to other smallholders in future seasons. Most farmers are risk averse and hesitant to adopt new practices, so we knew our first farmers would need be experienced in growing vegetables, respected in their community, and willing to adopt new practices. The two farmers we are working with this year meet these requirements, but they also have more land and more alternative income streams than the “target” farmers with whom we plan to partner in the long term. Over the next three months we will spend much more time with our first two farmers: supporting them produce high yields, sharing (and receiving!) best practices; and learning about the specific challenges they face. We also plan to hold demo days with the broader community and visit local leadership in the surrounding villages, so that we can start to learn about the other farmers in our vicinity. All this information will help us greatly as we begin to plan and develop our smallholder engagement model for the next season. Last quarter, we spent a lot of time in the greenhouse. We captured the birth of the nursery in our Greenhouse blog with a time-lapse video. Once built, the greenhouse became a home for almost 40,000 tomato plants, providing them with a safe and sheltered environment for the first 50 days of their lives. It’s no secret that the #TeamTomatoJos founders have limited farming experience, but we didn’t know just how “green” (forgive the pun) we were until November, when we noticed that a number of our seedlings seemed to be unwell. After consulting with Al and a few other experts, we realized we had been killing our plants with kindness: giving them too much water and too much fertilizer. This resulted in nitrogen “burn” on the leaves, and underdeveloped root systems. We ended up killing almost 1/3 of our plants before we were able to revise our protocol, which meant we had to sow additional seeds in December. Fortunately, we are growing strong, healthy seedlings using the revised protocol, and we were able to make changes quickly and keep moving forward because the overall size of our proof-of-concept trial is relatively small. Once all our seedlings are transplanted into the open field, we plan to use our greenhouse as a greenhouse rather than a nursery. In order to maximize our learning and make the best use of our assets, we will grow indeterminate (vine) tomatoes as well as a few other vegetables in the greenhouse, to see how well they do in this environment. Water has been a common theme over the last 3 months – in our blog posts as well as on our instagram, twitter and facebook accounts. Tomatoes require a LOT of water to reach their full yield potential. So this past quarter, we dug a borehole, built a 40,000-liter water storage system, and installed drip lines on the nucleus farm. In order to operate our borehole and irrigation system, we have had to be in turns plumbers, electricians, and problem solvers. Water is absolutely essential for vegetable farming, and during the Christmas break we had a few close calls where we came close to emptying the tanks – literally! We have realized that it is important to document and follow an irrigation protocol to ensure that we are watering our plants the right amount, and to make sure that our storage system is never empty. We are currently working on this protocol, so that our plants can stay well hydrated in the coming quarter. As our tomato crop matures, our need for water will also increase – stay tuned for details on how our infrastructure copes! Our last blog documented a major milestone for us: after months of field preparation, we started transplanting! Our fields must be the most harrowed fields in all of Nigeria, but we are happy that our baby transplants have been given the best opportunity for success. In our field prep blog, we detailed our early approach to getting the fields ready for transplanting and shared information about the equipment that we used. Once our agronomist Al came on board, he told us what we’d done well, and what we would need to do again or do differently. In particular, the soil in some areas of the field was still very compact - we had to harrow multiple times to get the soil soft enough to make our beds. For the most part, our field prep work is complete. Over the next three months, our farm attendants will scout the fields for signs of disease and pests on the plants, so that we can respond quickly and effectively if problems arise. In December, we met with the Paramount Chief in our development area to introduce Tomato Jos and learn about how we might be able to work with the villages that he leads. The Chief was very receptive to our business idea and pledged his support and assistance to help us further integrate into the local community. As we continue to develop relationships with our suppliers and vendors, we have begun to realize just how important it is to keep them up-to-date on our activities and have regular meetings or phone discussions, as opposed to only getting in touch when we need to buy something. While on paper they may simply be providing us with seeds, or fertilizer, or capital equipment, these are businesses that have been on the ground in Nigeria for some time and in reality they can offer a much deeper level of support if we are able to tap into it. For example, Syngenta has been working with smallholder tomato farmers in Kano and a few other areas in the north, doing work that mirrors what we are trying to do with farmers here in Nasarawa State. Next year we will need to expand our irrigation infrastructure significantly, as we expand the model. We plan to work with Netafim, a world-class irrigation company, to provide us with water solutions both for our own farm and for the smallholders. Another irrigation partner with whom we are excited to work is Kickstart International. Kickstart has helped over 166,000 families to climb out of poverty by providing them with mechanically driven, people-powered pumps. These pumps allow smallholder farmers to irrigate up to 2 acres of land and farm vegetables in the dry season. Speaking of Kickstart, our Kickstarter campaign last quarter was a tremendous success! We remain incredibly grateful to the 638 backers who contributed $55,178.11 to support our tomato paste processing activities. We are so excited to make tomato paste! Though we now have money available for processing equipment, we’ve realized that not all of the funds we raised will be able to go directly to the processing. Besides the fees paid to Kickstarter and Amazon Payments, we will also have to spend some money (and more importantly, a significant amount of time) to fulfill rewards for our loyal backers. Sending jollof rice spice mix to 85 people (mostly in America) from Nigeria is no small feat! But we have a great design team based in the US that is committed to helping us meet our fulfilment deadlines. Other than securing financial resources, relatively little progress was made in operationalizing our processing capacity. We were mostly focused on the tomatoes! In the quarter ahead, we will rent some of the equipment we need, and purchase the rest. We don’t want to buy everything outright, since next year we will be significantly larger and will therefore need much larger-scale facilities. We are currently in negotiations to buy some equipment that meets our needs for this first season, and we expect to make a purchase by the end of January so that the processing equipment will be available well before we harvest in March. In early December, we purchased Amanda, our Toyota Hilux. She is the backbone of our logistics and transportation system – without Amanda, we would be stranded! We also completed construction of St. Bart’s, our living quarters, and the Tomato Jos office. We no longer have to take conference calls in the pump house! 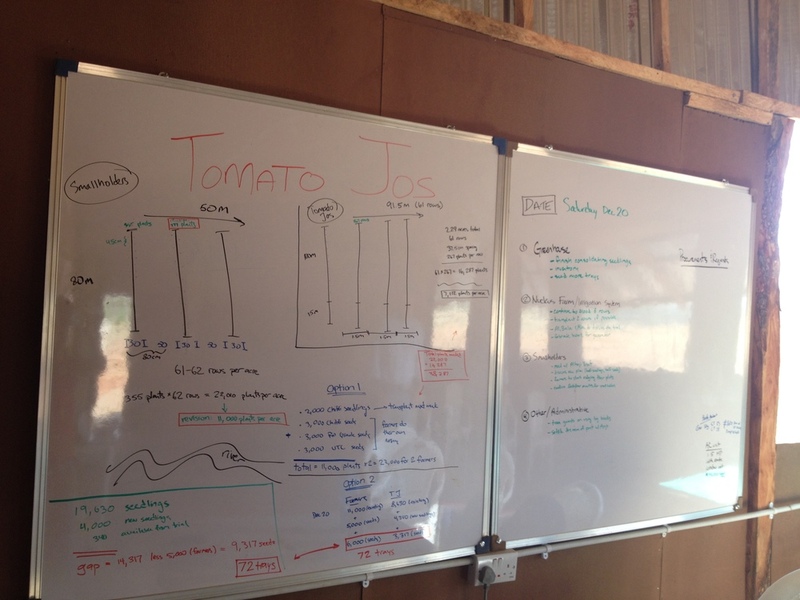 And more importantly, we now have a whiteboard that we can use to plan and brainstorm! 3. Get our “back office” in order so that we can start to fundraise for expansion once we prove that our product is acceptable in the market. Besides these focus areas, we will continue to expand #TeamTomatoJos by finding more incredible people to help us develop our various business lines. We will also continue to work closely with our smallholders and partner organizations to develop our engagement strategy for the next season. This last quarter has been incredibly busy, from fertilizing to fundraising, and we have learned from both our successes and our failures. Next quarter, we will see how we perform as farmers and processors. Stay tuned on our instagram, twitter and facebook accounts for more!